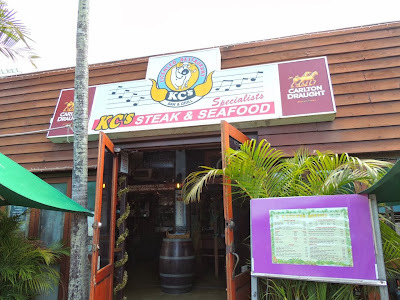 Last year, my husband and I took a dream trip to Australia, and one of the absolute highlights of the trip was eating at KC's Bar & Grill in Airlie Beach. First of all, if you want to visit the Great Barrier Reef and the Whitsundays, Airlie Beach is where you want to stay. The marina has many options when it comes to visiting the reef and the islands. The town also has stores that feature everything you could need while traveling, and of course, they have amazing restaurants. We ate at KC's twice while we were in Airlie Beach, both times during lunch. This was the only restaurant we visited twice the whole time we were in Australia, so you know it's pretty special. 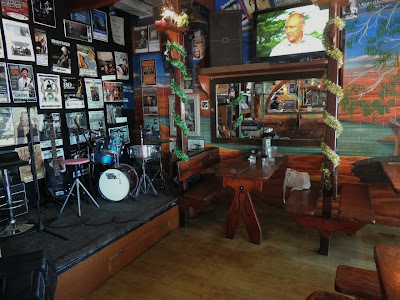 If you go in the evening, there's often live music, so I'd recommend checking that out. I could hear the music as we walked to our hotel a couple nights. The interior of the restaurant is pretty quirky. 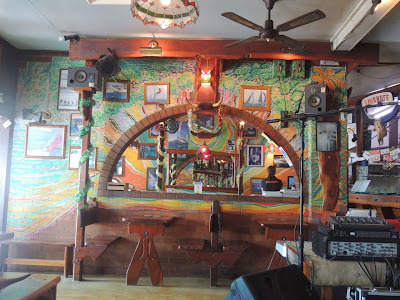 The walls are painted with brightly colored murals, and the seating is like an upgrade from picnic tables. There's a stage all ready for the night's musical performances. There isn't any air conditioning, but the fans help. The staff is friendly, and the food is delicious. Really, what more could you want? The kangaroo is the darker meat, and the crocodile is the lighter meat. The main reason we went to KC's was that my husband wanted to try crocodile and kangaroo while in Australia. 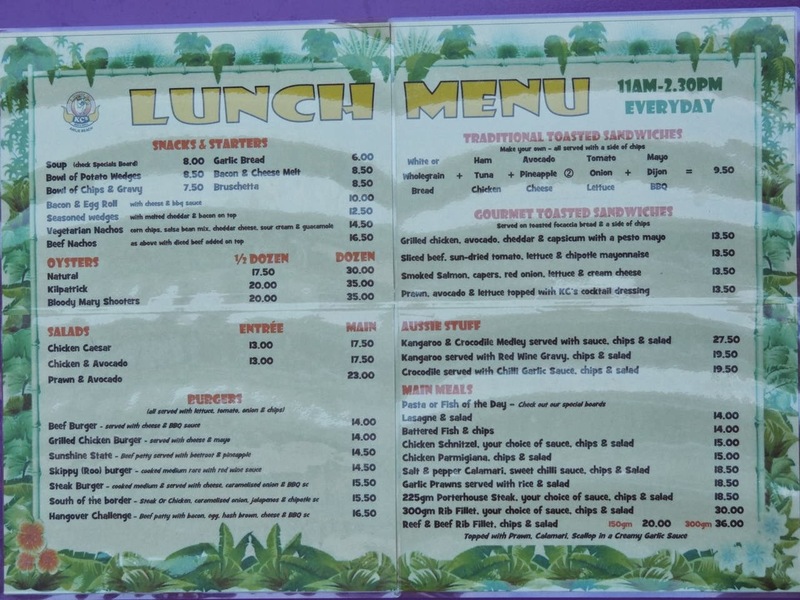 Both times we ate there, he ordered the Kangaroo & Crocodile Medley, which is served with chips (fries) and salad. 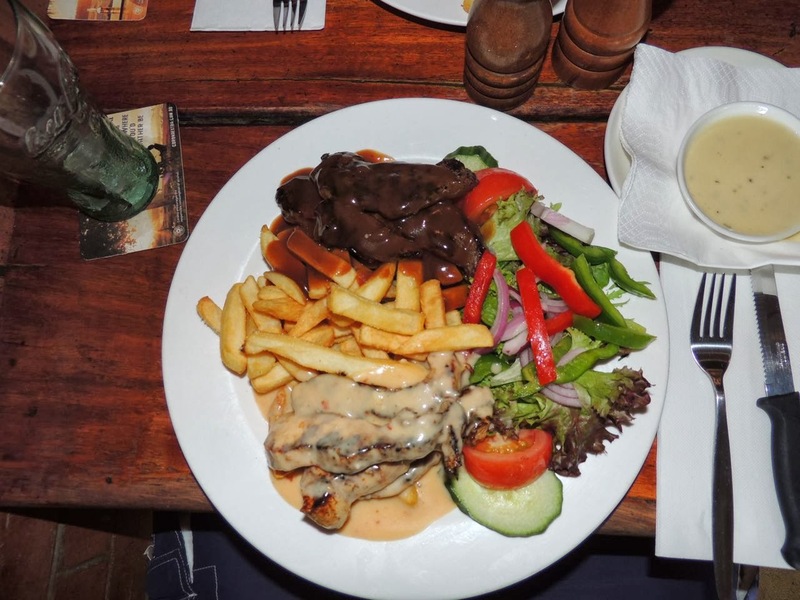 The kangaroo was topped with a red wine gravy, and the crocodile was topped with a chili garlic sauce. He said that the kangaroo kind of tasted like rare beef. We were told that it has to be cooked on the rare side in order to prevent it from getting too tough. The crocodile tasted kind of like chicken with a slightly fishy taste. He really liked both of them, and the sauces were really well matched to the meats, but he liked the sauce on the crocodile a little bit more. 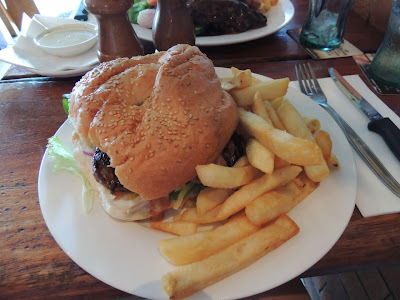 The first time we ate at KC's, I ordered the Steak Burger. It was huge, but I was hungry! The meat was perfectly cooked, and it came with a side of chips (fries). I loved it all! 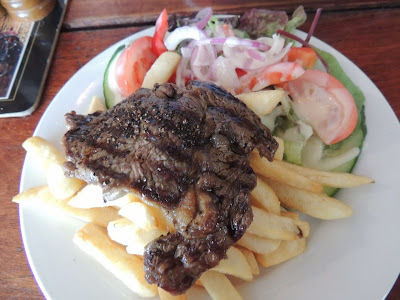 The second time we ate at KC's, I ordered the steak special which came with chips (fries) and a salad. It seems like the typical meal in Australia is meat with chips and a salad. 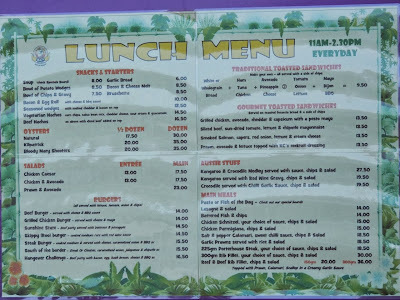 I really miss the chips and salad. Somehow it just doesn't taste the same in "the States," which was how everyone there referred to the U.S. If you're planning a trip to the Great Barrier Reef, I highly recommend booking a hotel in Airlie Beach and eating at KC's. I know my husband and I plan to do just that the next time we visit Australia.